Call no more than two weeks, but at least 48 hours, before you begin digging (not including weekends and holidays and all of your local utility companies will be notified about your digging project. Each utility will visit your property to mark, free of charge, and each with a different color paint or flag, where the buried power, sewer, natural gas, water and cable lines are within the area where you want to dig. After your local utilities — like Illinois Gas Company — mark where their underground utility lines are, you can dig with confidence, because you’ll know how to avoid any damage to these underground utility lines, which might interrupt or hinder your services and potentially damage your property. 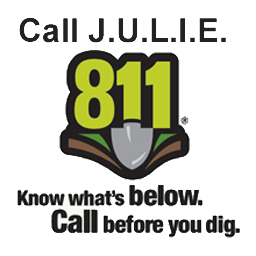 So, whether you’re doing some planting of shrubs or trees, adding a deck, or any other small or large project that requires digging, remember to make the call that matters – it’s for your safety and it’s the law. Illinois Gas Company carefully patrols all our “critical” gas lines – those lines that are eight inches or larger in diameter and run at higher pressures. If, after you contact JULIE, it is determined that your project location is near a critical gas line, you will be contacted by our service personnel. In many instances, an Illinois Gas Company representative will be onsite during digging. This service is free.